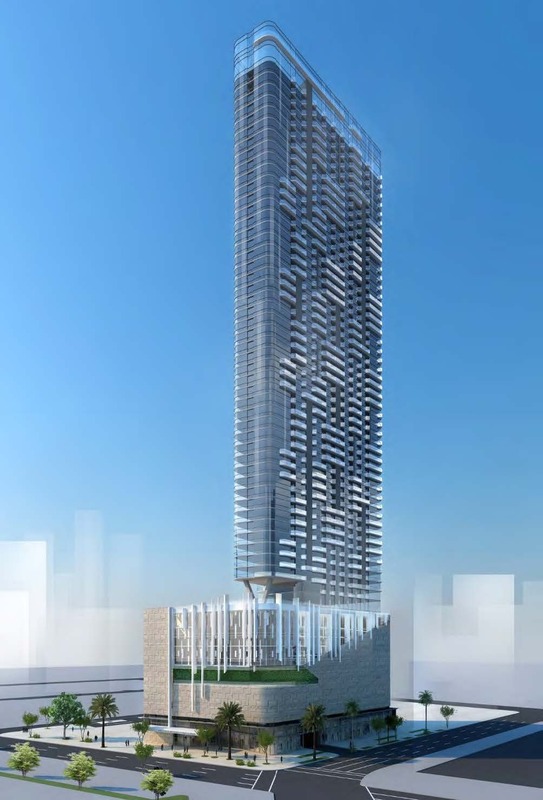 PMG’s 32-story X Miami apartment tower is now nearly full after opening last July, according to a new email newsletter from the developer. Work is now underway at X Biscayne across the street. It will be much bigger, the letter said. X Biscayne will have 1,088 beds and will be completed on spring 2021. By comparison, X Miami has 638 beds. X Miami was originally built with 464 apartment units, although some were converted to hotel use. 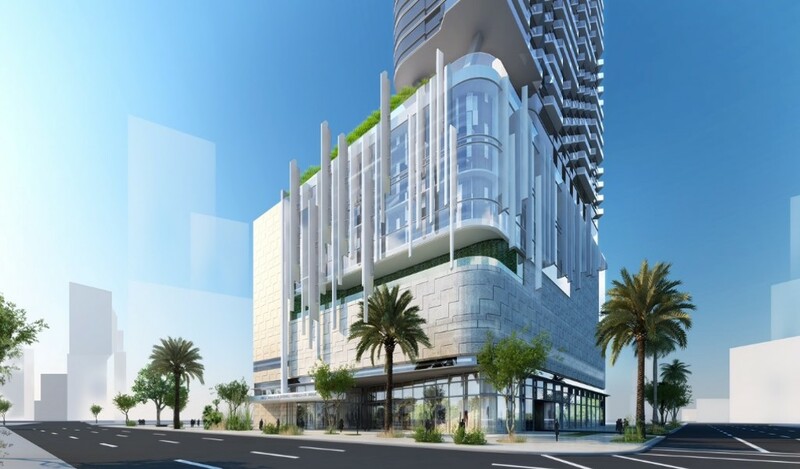 A county utilities filing shows that X Biscayne will have 704 apartments. X Biscayne will also be the biggest building yet for PMG’s X Social Communities, which now has 11 projects in 7 markets. X Las Olas, which is under construction, will be second with 923 beds opening spring 2020. X Miami’s lobby bar and restaurant, Jaguar Sun, and sister café, Mockingbird, have opened to rave reviews and loyal followings, the letter said. And a church right downstairs to repent all those millennial sins! See – that was funny! …That X building certainly has a compelling offering. Excellent amenities and a flexible arrangements. I see this particular model as a permanent fixture in the MF rental industry. But I’m no expert. I like this building.. even if the haters of unaligned balconies doesn’t. The balconies are so God awful, along with the blank wall at the side which will probably be covered with some God awful pukey mural. Shame, because the subtle curves in the tower would have been a plus one. All the cool buildings around MDC Wolfson are being built after I graduated. Ah yes, the United States, famous for providing instant and high paying employment to its college graduates. Ahhh yes, aceraoja, knows exactly when this poster graduated from college. Great option.. especially being able to co-live and play with similar people and interests. What happens if fire are the right Fire code used in the building structure. The .U.K. high rise lost a lot of lives to poor building structure? Are you asking if it will be built to code? It is Miami, so can’t be sure, I guess? Sad. This is what it’s come to for young adults. Living in dorms when they should be forming families and growing up. Blame it on capitalism which preaches paying low wages to pay for obscene rents. Much prefer capitalist small private apartment housing than communist small apartment shared with 10 other people and no air conditioning. I was born in a communist country. Capitalism may not be perfect but believe me communism is a lot worse even if it sounds better on paper for some. The communist system is not the problem.. people who run the system are the problem. Don’t need to, but apparently you don’t know that the word “communist” comes from the root word “Community.” If you didn’t have such an sub-par education, you would know that people run a system, not the other way around. Except communism is unattainable for the simple fact it’s completely at odds with human nature. The proletariat wants more, and so does the guy in charge who claims to speak for him. And who do you think you will replace those people with… other people who will become the problem. Making communism itself… the problem. Really, go live in Greece where you get 200 Euro pension. God forbid young adults these days follow a different model for living, rather than just following in lockstep with what generations before them have done. But, you know, if you don’t pursue more housing than you actually need (read: almost every previous generation) with the lower salaries and less job security that the economy currently offers thanks to the excellent policy decisions by all those “grown ups” that came before us, we’re not “grown ups”. Don’t worry.. I’m of the older generation and I envy you young adults for having the downtown including Brickell to now live in that my generation didn’t have. All I can say is, enjoy your youth and party on and forget the bashers. I didn’t know it was compulsory to be forming families.